Before this night is over, Meat Loaf will be declared a legend. Granted, the oracle won't be issued by the most otherworldly of sources - it will be proclaimed by Buddhist hunk Richard Gere - but still, that kind of handle isn't attached to just anyone. Most amazing of all is that the pronouncement will pertain to Meat Loaf's artistic outpour long before his recent platinum comeback smash, Bat Out of Hell II: Back Into Hell, debuted at No. 3 on the Billboard charts and left a nation uttering the words 'go figure.' Gere will even refer to Meat Loaf before the days of 1977, when Bat Out Of Hell - the hormone drenched classic that fused pop, schlock and opera - started on its way to becoming the third best-selling album of all time. Specifically, Gere will be reminiscing about the late '60s and early '70s, when Meat Loaf - he of oven-stuffed girth - was a star on Broadway (in such productions as Hair) and sat in with bands in New York City's downtown rock haunts. "I remember doing Shakespeare In The Park with Raul Julia," Meat Loaf will recall, "and then immediately heading to Max's Kansas City and singing. It was very schizophrenic." You see although they were written 16 years apart, both Bat Out Of Hell sagas are constructed as soundtracks to the same movie. The film - which Steinman refers to as a "futuristic, rock & roll Peter Pan" - perhaps not so shockingly, has never been made. But as the theory goes, the character singing "Two Out Of Three Ain't Bad" eons ago is the same one crooning "Lost Boys And Golden Girls" in the here and now. And Bat II is certainly not afraid to provide nods to the past will all the subtlety of a boot to the skull. The second line of the album is "I'd run right into hell and back." Two tracks even quote directly from Bat I's most nostalgia-sacred moment, "Paradise By The Dashboard Lights." In "Wasted Youth," Meat Loaf begins, "I remember every little thing as if it happened only yesterday." And in "Objects In The Rearview Mirror May Appear Closer Than They Are," he continually repeats, "It was long ago and far away." Simultaneously lustily juvenile and painfully pretentious, both albums share a flair for the gut level and the grandiose - somewhere between American Top Forty and musical melodrama. "I'm different from Bette or Cher or Sinatra," Meat Loaf is saying emphatically and completely out of the blue, just a short time away from being granted luminary status. "This might be a huge ego thing, but I tend to think of myself as the Robert De Niro of rock. I know that's absurd, by my idols are either sports figures or Robert De Niro." Suddenly, rock's newly anointed raging bull stops to deflect attention back to his songwriter and producer. "Nobody writes like Jim Steinman," he says of the man some credit with Meat Loaf's success. "All these things - bombastic, over the top, self-indulgent. All these things are positives." And as quick as you can say, "Oh, come on," Gere is seated next to Leno, explaining that when he first came to make his mark on Broadway, Meat Loaf was already a mythic figure. His vanity vindicated, Meat Loaf is beaming. As it turns out, the Meat Loaf saga is one as vast and expansive as the man himself. The tale starts - as all things larger than life do - in Texas. Before there was Meat Loaf, there was little Marvin Aday - big, little Marvin Aday. "I was playing grade-school football," says Meat Loaf of his days growing up in Dallas. "I was 10 years old and weighed 200 pounds. They called me Meat Loaf." This fact, it turns out, is one of the few that exist of Meat Loaf: The Early Years. "I remember high school but not much before then," Meat Loaf says. "I think it's because my father was an alcoholic and my mother had cancer." When he was 15, Meat Loaf's mother passed away, That's when everything snapped. "Apparently, at my mother's funeral, I was really crazy," says Meat Loaf. "And my father flipped out as well. I was in the house with a friend and my father comes in screaming, 'Get these women out of here.' But there was nobody there. I went into my father's bedroom, and my father came at me with a butcher knife. It was like a movie. I rolled off the bed, and the butcher knife hit dead in the center of the bed. So, I left, and that was the end of Texas." Next stop, Los Angeles. Then Detroit. Finally, New York City, to begin the career that would eventually make Richard Gere prick up his ears. "He was larger than life," says Steinman, who first met Meat Loaf at the New York Shakespeare Festival Theater and soon after began working with him on Bat Out Of Hell. "That's the first thing that registered to me. It was like a revelation." Revelation soon gave way to international sensation (since its release in 1977, Bat Out Of Hell has sold more than 30 million copies worldwide). International sensation, in turn, was followed by extreme meltdown. The ingredients of this catastrophe were many: alcohol, drugs, terror over the concept of stardom. "I was nuts," says Meat Loaf. "I mostly turned it inward. And it was all over being famous. I didn't want people to call me a star." The results of the crisis were just as dire: There's the break with his manager (who, incidentally, still manages Steinman), which ended in a series of lawsuits, and the loss of his voice. "I felt like a leper," says Meat Loaf. "I felt like I was on an island with my wife and two daughters." Three years later, when the dust began to settle, Meat Loaf had declared personal bankruptcy in order to halt the lawsuits; his working partnership with Steinman was over; and he had endured years of both physical and psychological therapy to regain his voice. "The problem was with a million different forces - his managers, his lawyers, his vocal chords, his brain," says Steinman. "I actually just left. I spent seven months trying to make a follow-up to Bat Out Of Hell with him and it was an infernal nightmare. He had lost his voice, he had lost his house, and he was pretty much losing his mind." Perhaps most amazingly, despite the fact that Meat Loaf refers to the period as "totally crazy, it was padded cell time," he kept working. He recorded five albums, most of which are so forgettable that everyone seems to have, well, forgotten them. He toured in Europe and Australia, where his star never faded. He acted in films (recently Wayne's World and Leap Of Faith). In short, he supported his family any way and the only way he knew how. "When I declared bankruptcy, they said, 'It's not like this big scourge,'" says Meat Loaf. "But it was a big scourge. It was horrible. The kids took a beating. My wife would try to write a check at the grocery store, and they wouldn't take it, even though it was fine. So I just worked. I always have. No big deal." Which finally led to Bat Out Of Hell II. 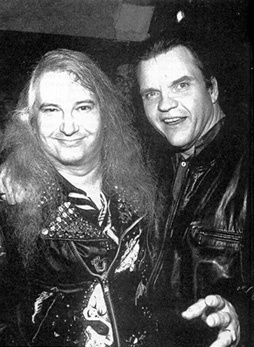 The only problem, as Steinman saw it, was that Meat Loaf had shed more than 80 pounds since last they met (during recording, Steinman would leave trails of doughnuts around the studio in hopes of beefing up Meat Loaf.) No matter. For better or worse - and when comparison shopping, Bat II is the latter - the public is already buying Meat Loaf by the millions. Bat I has sold a million copies in each of the last four years alone. Richard Gere is waxing nostalgic. The Meat Loaf legend - as it has now been officially coined - has been bulked up by another chapter. "I've always been convinced that his vocal chords are directly related to his id," says Steinman of his bi-decade partner. "I think they reflect a lot about what was going on. The weirdest thing is that I honestly said to people in '78, when things were falling apart, that I bet it takes at least a decade. To me, the timing of all of this has been so natural." Whatever the timing, whatever the reasons - a longing for the past or a new batch of libido-driven record buyers - Meat Loaf is laughing. It's 1993, and he has driven America to the same hell he did 16 years ago. "When I hear these lyrics, I think they're the funniest things I've ever heard, "Meat Loaf says, exuding over-caffeinated charm. "I play everything for real. That's the best comedy. And I know I'll get to do another one, and I know I'll always keep working. I've always imagined myself ending up being Wilford Brimley in 20 years."